Buy PermaSEAL’s Brown Eco X cavity drain membrane in bulk to benefit from significant savings. This high quality and versatile membrane is suitable for waterproofing floors and walls both internally and externally. 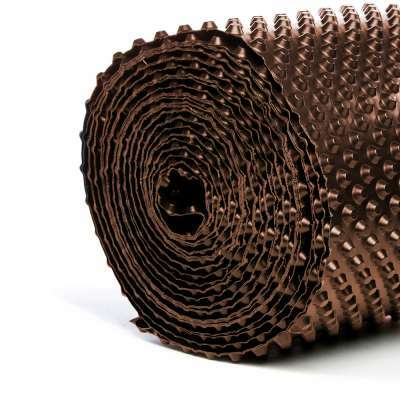 A cavity drain membrane suitable for use internally and externally, above and below ground, the PermaSEAL 8 Eco X Brown is a highly versatile HDPE membrane. 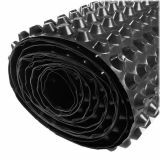 The diagonal 8mm stud formation means that this membrane has a larger number of studs per metre squared. This increases its compressive loading stability to 250kn/m when compared to other membranes, making it ideal for flooring applications. The membrane is highly resistant to chemicals, resistant to root penetration, rot proof and neutral towards drinking water. It is also resistant to bacteria, fungi, and other small organisms. This PermaSEAL brown cavity drain membrane is suitable for use when constructing a Grade 3 environment in accordance with BS 8102:2009 – protection of below ground structures against water from the ground. As the UK importer, Permagard is able to offer contractors and trade customers huge savings when they buy the Eco X membranes by the pallet. We can supply pallets direct to contractors at a discounted rate. The PermaSEAL 8 Eco X brown membrane comes in a 12 roll pallet with a bulk discount of 26%. We provide next day delivery when you order a pallet of membranes before 1pm. If you haven’t used PermaSEAL cavity drain membranes before or have any technical questions, then Permagard is more than happy to help. We pride ourselves on offering you the information you need both before and after any purchase. Call us on 0117 982 3282. Note: All cavity drain membranes should be permanently protected against UV Light. Failure to do this will dramatically decrease the service life of the product.